This article is about the government of Paris in 1871. For the Paris Commune during the French Revolution, see Paris Commune (French Revolution). The Paris Commune (French: La Commune de Paris, IPA: [la kɔmyn də paʁi]) was a radical socialist and revolutionary government that ruled Paris from 18 March to 28 May 1871. The Franco-Prussian War had led to the capture of Emperor Napoleon III in September 1870, the collapse of the Second French Empire, and the beginning of the Third Republic. Because Paris was under siege for four months, the Third Republic moved its capital to Tours. A hotbed of working-class radicalism, Paris was primarily defended during this time by the often politicised and radical troops of the National Guard rather than regular Army troops. Paris surrendered to the Prussians on 28 January 1871, and in February Adolphe Thiers, the new chief executive of the French national government, signed an armistice with Prussia that disarmed the Army but not the National Guard. Debates over the policies and outcome of the Commune had significant influence on the ideas of Karl Marx, who described it as an example of the "dictatorship of the proletariat". On 2 September 1870, after France's defeat at the Battle of Sedan in the Franco-Prussian War, Emperor Napoleon III surrendered to the Prussian Chancellor Otto von Bismarck. When the news reached Paris the next day, shocked and angry crowds came out into the streets. Empress Eugénie de Montijo, the Emperor's wife and acting Regent at the time, fled the city, and the Government of the Second Empire swiftly collapsed. Republican and radical deputies of the National Assembly went to the Hôtel de Ville, proclaimed the new French Republic, and formed a Government of National Defence. Though the Emperor and the French Army had been defeated at Sedan, the war continued. The German army marched swiftly toward Paris. In 1871 France was deeply divided between the large rural, Catholic and conservative population of the French countryside and the more republican and radical cities of Paris, Marseille, Lyon and a few others. In the first round of the 1869 parliamentary elections held under the French Empire, 4,438,000 had voted for the Bonapartist candidates supporting Napoleon III, while 3,350,000 had voted for the republican opposition. In Paris, however, the republican candidates dominated, winning 234,000 votes against 77,000 for the Bonapartists. During the war and the siege of Paris, various members of the middle- and upper-classes departed the city; at the same time there was an influx of refugees from parts of France occupied by the Germans. The working class and immigrants suffered the most from the lack of industrial activity due to the war and the siege; they formed the bedrock of the Commune's popular support. The Commune resulted in part from growing discontent among the Paris workers. This discontent can be traced to the first worker uprisings, the Canut revolts, in Lyon and Paris in the 1830s (a canut was a Lyonnais silk worker, often working on Jacquard looms). Many Parisians, especially workers and the lower-middle classes, supported a democratic republic. A specific demand was that Paris should be self-governing with its own elected council, something enjoyed by smaller French towns but denied to Paris by a national government wary of the capital's unruly populace. They also wanted a more "just" way of managing the economy, if not necessarily socialist, summed up in the popular appeal for "la république démocratique et sociale!" ("the democratic and social republic!"). Socialist movements, such as the First International, had been growing in influence with hundreds of societies affiliated to it across France. In early 1867, Parisian employers of bronze-workers attempted to de-unionise their workers. This was defeated by a strike organised by the International. Later in 1867, an illegal public demonstration in Paris was answered by the legal dissolution of its executive committee and the leadership being fined. Tensions escalated: Internationalists elected a new committee and put forth a more radical programme, the authorities imprisoned their leaders, and a more revolutionary perspective was taken to the International's 1868 Brussels Congress. The International had considerable influence even among unaffiliated French workers, particularly in Paris and the big towns. The killing of journalist Victor Noir incensed Parisians, and the arrests of journalists critical of the Emperor did nothing to quiet the city. A coup was attempted in early 1870, but tensions eased significantly after the plebiscite in May. The war with Prussia, initiated by Napoleon III in July, was initially met with patriotic fervour. Paris is the traditional home of French radical movements. Revolutionaries had gone into the streets to oppose their governments during the popular uprisings of July 1830 and June 1848, and on many other occasions. Of the radical and revolutionary groups in Paris at the time of the Commune, the most conservative were the "radical republicans". This group included the young doctor and future prime minister Georges Clemenceau, who was a member of the National Assembly and Mayor of the 18th arrondissement. Clemenceau tried to negotiate a compromise between the Commune and the government, but neither side trusted him; he was considered extremely radical by the provincial deputies of rural France, but too moderate by the leaders of the Commune. The most extreme revolutionaries in Paris were the followers of Louis Auguste Blanqui, a charismatic professional revolutionary who had spent most of his adult life in prison. He had about a thousand followers, many of them armed and organized into cells of ten persons each. Each cell operated independently and was unaware of the members of the other groups, communicating only with their leaders by code. Blanqui had written a manual on revolution, Instructions for an Armed Uprising, to give guidance to his followers. Though their numbers were small, the Blanquists provided many of the most disciplined soldiers and several of the senior leaders of the Commune. By 20 September 1870, the German army had surrounded Paris and was camped just 2,000 metres (6,600 ft) from the French front lines. The regular French Army in Paris, under General Trochu's command, had only 50,000 professional soldiers of the line; the majority of the French first-line soldiers were prisoners of war, or trapped in Metz, surrounded by Germans. The regulars were thus supported by around 5,000 firemen, 3,000 gendarmes, and 15,000 sailors. The regulars were also supported by the Garde Mobile, new recruits with little training or experience. 17,000 of them were Parisian, and 73,000 from the provinces. These included twenty battalions of men from Brittany, who spoke little French. The largest armed force in Paris was the Garde Nationale, or National Guard, numbering about 300,000 men. They also had very little training or experience. They were organised by neighbourhoods; those from the upper- and middle-class arrondissements tended to support the national government, while those from the working-class neighbourhoods were far more radical and politicised. Guardsmen from many units were known for their lack of discipline; some units refused to wear uniforms, often refused to obey orders without discussing them, and demanded the right to elect their own officers. The members of the National Guard from working-class neighbourhoods became the main armed force of the Commune. Eugène Varlin led several thousand National Guard soldiers to march to the Hotel de Ville chanting 'Long Live the Commune!". As the Germans surrounded the city, radical groups saw that the Government of National Defence had few soldiers to defend itself, and launched the first demonstrations against it. On 19 September, National Guard units from the main working-class neighbourhoods—Belleville, Menilmontant, La Villette, Montrouge, the Faubourg Saint-Antoine, and the Faubourg du Temple—marched to the centre of the city and demanded that a new government, a Commune, be elected. They were met by regular army units loyal to the Government of National Defence, and the demonstrators eventually dispersed peacefully. On 5 October, 5,000 protesters marched from Belleville to the Hotel de Ville, demanding immediate municipal elections and rifles. On 8 October, several thousand soldiers from the National Guard, led by Eugène Varlin of the First International, marched to the centre chanting 'Long Live the Commune! ", but they also dispersed without incident. Later in October, General Louis Jules Trochu launched a series of armed attacks to break the German siege, with heavy losses and no success. The telegraph line connecting Paris with the rest of France had been cut by the Germans on 27 September. On 6 October, Defense Minister Léon Gambetta departed the city by balloon to try to organise national resistance against the Germans. On 28 October, the news arrived in Paris that the 160,000 soldiers of the French army at Metz, which had been surrounded by the Germans since August, had surrendered. The news arrived the same day of the failure of another attempt by the French army to break the siege of Paris at Bourget, with heavy losses. On 31 October, the leaders of the main revolutionary groups in Paris, including Blanqui, Félix Pyat and Louis Charles Delescluze, called new demonstrations at the Hotel de Ville against General Trochu and the government. Fifteen thousand demonstrators, some of them armed, gathered in front of the Hôtel de Ville in pouring rain, calling for the resignation of Trochu and the proclamation of a commune. Shots were fired from the Hôtel de Ville, one narrowly missing Trochu, and the demonstrators crowded into the building, demanding the creation of a new government, and making lists of its proposed members. On 3 November, city authorities organized a plebiscite of Parisian voters, asking if they had confidence in the Government of National Defence. "Yes" votes totalled 557,996, while 62,638 voted "no". Two days later, municipal councils in each of the twenty arrondissements of Paris voted to elect mayors; five councils elected radical opposition candidates, including Delescluze and a young Montmartrean doctor, Georges Clemenceau. In September and October Adolphe Thiers, the leader of the National Assembly conservatives, had toured Europe, consulting with the foreign ministers of Britain, Russia, and Austria, and found that none of them were willing to support France against the Germans. He reported to the Government that there was no alternative to negotiating an armistice. He travelled to German-occupied Tours and met with Bismarck on 1 November. The Chancellor demanded the cession of all of Alsace, parts of Lorraine, and enormous reparations. The Government of National Defence decided to continue the war and raise a new army to fight the Germans. The newly organized French armies won a single victory at Coulmiers on 10 November, but an attempt by General Auguste-Alexandre Ducrot on 29 November at Villiers to break out of Paris was defeated with a loss of 4,000 soldiers, compared with 1,700 German casualties. At the same time as the demonstration in Paris, the leaders of the Government of National Defence in Bordeaux had concluded that the war could not continue. On 26 January, they signed a ceasefire and armistice, with special conditions for Paris. The city would not be occupied by the Germans. Regular soldiers would give up their arms, but would not be taken into captivity. Paris would pay an indemnity of 200 million francs. At Jules Favre's request, Bismarck agreed not to disarm the National Guard, so that order could be maintained in the city. The national government in Bordeaux called for national elections at the end of January, held just ten days later on 8 February. Most electors in France were rural, Catholic and conservative, and this was reflected in the results; of the 645 deputies assembled in Bordeaux on February, about 400 favoured a constitutional monarchy under either Henri, Count of Chambord (grandson of Charles X) or Prince Philippe, Count of Paris (grandson of Louis Philippe). Of the 200 republicans in the new parliament, 80 were former Orléanists (Philippe's supporters) and moderately conservative. They were led by Adolphe Thiers, who was elected in 26 departments, the most of any candidate. There were an equal number of more radical republicans, including Jules Favre and Jules Ferry, who wanted a republic without a monarch, and who felt that signing the peace treaty was unavoidable. Finally, on the extreme left, there were the radical republicans and socialists, a group that included Louis Blanc, Léon Gambetta and Georges Clemenceau. This group was dominant in Paris, where they won 37 of the 42 seats. Clemenceau, a friend of several revolutionaries, tried to negotiate a compromise; some cannons would remain in Paris and the rest go to the army. However, Thiers and the National Assembly did not accept his proposals. The chief executive wanted to restore order and national authority in Paris as quickly as possible, and the cannons became a symbol of that authority. The Assembly also refused to prolong the moratorium on debt collections imposed during the war; and suspended two radical newspapers, Le Cri du Peuple of Jules Valles and Le Mot d'Ordre of Henri Rochefort, which further inflamed Parisian radical opinion. Thiers also decided to move the National Assembly and government from Bordeaux to Versailles, rather than to Paris, to be farther away from the pressure of demonstrations, which further enraged the National Guard and the radical political clubs. On 17 March 1871, there was a meeting of Thiers and his cabinet, who were joined by Paris mayor Jules Ferry, National Guard commander General D'Aurelle de Paladines and General Joseph Vinoy, commander of the regular army units in Paris. Thiers announced a plan to send the army the next day to take charge of the cannons. The plan was initially opposed by War Minister Adolphe Le Flô, D'Aurelle de Paladines, and Vinoy, who argued that the move was premature, because the army had too few soldiers, was undisciplined and demoralized, and that many units had become politicized and were unreliable. Vinoy urged that they wait until Germany had released the French prisoners of war, and the army returned to full strength. Thiers insisted that the planned operation must go ahead as quickly as possible, to have the element of surprise. If the seizure of the cannon was not successful, the government would withdraw from the centre of Paris, build up its forces, and then attack with overwhelming force, as they had done during the uprising of June 1848. The Council accepted his decision, and Vinoy gave orders for the operation to begin the next day. Early in the morning of 18 March, two brigades of soldiers climbed the butte of Montmartre, where the largest collection of cannons, 170 in number, were located. A small group of revolutionary national guardsmen were already there, and there was a brief confrontation between the brigade led by General Claude Lecomte, and the National Guard; one guardsman, named Turpin, was shot dead. Word of the shooting spread quickly, and members of the National Guard from all over the neighbourhood, including Clemenceau, hurried to the site to confront the soldiers. At 5:00 in the afternoon, the National Guard had captured another important prisoner: General Jacques Leon Clément-Thomas. An ardent republican and fierce disciplinarian, he had helped suppress the armed uprising of June 1848 against the Second Republic. Because of his republican beliefs, he had been arrested by Napoleon III and exiled, and had only returned to France after the downfall of the Empire. He was particularly hated by the national guardsmen of Montmartre and Belleville because of the severe discipline he imposed during the siege of Paris. Earlier that day, dressed in civilian clothes, he had been trying to find out what was going on, when he was recognized by a soldier and arrested, and brought to the building at Rue des Rosiers. At about 5:30 on 18 March, the angry crowd of national guardsmen and deserters from Lecomte's regiment at Rue des Rosiers seized Clément-Thomas, beat him with rifle butts, pushed him into the garden, and shot him repeatedly. A few minutes later, they did the same to General Lecomte. Doctor Guyon, who examined the bodies shortly afterwards, found forty balls in the body of Clément-Thomas and nine balls in the back of Lecomte. By late morning, the operation to recapture the cannons had failed, and crowds and barricades were appearing in all the working-class neighborhoods of Paris. General Vinoy ordered the army to pull back to the Seine, and Thiers began to organise a withdrawal to Versailles, where he could gather enough troops to take back Paris. On the afternoon of 18 March, following the government's failed attempt to seize the cannons at Montmartre, the Central Committee of the National Guard ordered the three battalions to seize the Hôtel de Ville, where they believed the government was located. They were not aware that Thiers, the government, and the military commanders were at the Ministry of Foreign Affairs, where the gates were open and there were few guards. They were also unaware that Marshal Patrice MacMahon, the future commander of the forces against the Commune, had just arrived at his home in Paris, having just been released from imprisonment in Germany. As soon as he heard the news of the uprising, he made his way to the railway station, where national guardsmen were already stopping and checking the identity of departing passengers. A sympathetic station manager hid him in his office and helped him board a train, and he escaped the city. While he was at the railway station, national guardsmen sent by the Central Committee arrived at his house looking for him. In February, while the national government had been organising in Bordeaux, a new rival government had been organised in Paris. The National Guard had not been disarmed as per the armistice, and had on paper 260 battalions of 1,500 men each, a total of 390,000 men. Between 15 and 24 February, some 500 delegates elected by the National Guard began meeting in Paris. On 15 March, just before the confrontation between the National Guard and the regular army over the cannons, 1,325 delegates of the federation of organisations created by the National Guard elected a leader, Giuseppe Garibaldi (who was in Italy and respectfully declined the title), and created a Central Committee of 38 members, which made its headquarters in a school on the Rue Basfroi, between Place de la Bastille and La Roquette. The first vote of the new Central Committee was to refuse to recognise the authority of General D'Aurelle de Paladines, the official commander of the National Guard appointed by Thiers, or of General Vinoy, the Military Governor of Paris. 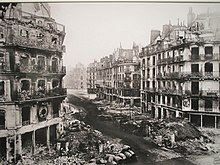 Late on 18 March, when they learned that the regular army was leaving Paris, units of the National Guard moved quickly to take control of the city. The first to take action were the followers of Blanqui, who went quickly to the Latin Quarter and took charge of the gunpowder stored in the Pantheon, and to the Orleans railway station. Four battalions crossed the Seine and captured the prefecture of police, while other units occupied the former headquarters of the National Guard at the Place Vendôme, as well as the Ministry of Justice. That night, the National Guard occupied the offices vacated by the government; they quickly took over the Ministries of Finance, the Interior, and War. At eight in the morning the next day, the Central Committee was meeting in the Hôtel de Ville. By the end of the day, 20,000 national guardsmen camped in triumph in the square in front of the Hôtel de Ville, with several dozen cannons. A red flag was hoisted over the building. A few candidates, including Blanqui (who had been arrested when outside Paris, and was in prison in Brittany), won in several arrondissements. Other candidates who were elected, including about twenty moderate republicans and five radicals, refused to take their seats. In the end, the Council had just 60 members. Nine of the winners were Blanquists (some of whom were also from the International); twenty-five, including Delescluze and Pyat, classified themselves as "Independent Revolutionaries"; about fifteen were from the International; the rest were from a variety of radical groups. One of the best-known candidates, Georges Clemenceau, received only 752 votes. The professions represented in the council were 33 workers; five small businessmen; 19 clerks, accountants and other office staff; twelve journalists; and a selection of workers in the liberal arts. All were men; women were not allowed to vote. The winners were announced on 27 March, and a large ceremony and parade by the National Guard was held the next day in front of the Hôtel de Ville, decorated with red flags. The new Commune held its first meeting on 28 March in a euphoric mood. The members adopted a dozen proposals, including an honorary presidency for Blanqui; the abolition of the death penalty; the abolition of military conscription; a proposal to send delegates to other cities to help launch communes there; and a resolution declaring that membership in the Paris Commune was incompatible with being a member of the National Assembly. This was aimed particularly at Pierre Tirard, the republican mayor of the 2nd arrondissement, who had been elected to both Commune and National Assembly. Seeing the more radical political direction of the new Commune, Tirard and some twenty republicans decided it was wisest to resign from the Commune. A resolution was also passed, after a long debate, that the deliberations of the Council were to be secret, since the Commune was effectively at war with the government in Versailles and should not make its intentions known to the enemy. The workload of the Commune leaders was usually enormous. The Council members (who were not "representatives" but delegates, subject in theory to immediate recall by their electors) were expected to carry out many executive and military functions as well as their legislative ones. Numerous organisations were set up during the siege in the localities (quartiers) to meet social needs, such as canteens and first-aid stations. For example, in the 3rd arrondissement, school materials were provided free, three parochial schools were "laicised", and an orphanage was established. In the 20th arrondissement, schoolchildren were provided with free clothing and food. At the same time, these local assemblies pursued their own goals, usually under the direction of local workers. Despite the moderate reformism of the Commune council, the composition of the Commune as a whole was much more revolutionary. Revolutionary factions included Proudhonists (an early form of moderate anarchism), members of the international socialists, Blanquists, and more libertarian republicans. Louise Michel, anarchist and famed "Red Virgin of Montmartre", became an important part of the legend of the Commune. Women played an important role in both the initiation and the governance of the Commune, though women could not vote in the Commune elections and there were no elected women members of the Commune itself. Their participation included building barricades and caring for wounded fighters. Joséphine Marchias, a washer woman, picked up a gun during the battles of May 22-23rd and said, "You cowardly crew! Go and Fight! If I'm killed it will be because I've done some killing first!" She was arrested as an incendiary, but there is no documentation that she was a pétroleuse (female incendiary). She worked as a vivandiére with the Enfants Perdus. While carrying back the laundry she was given by the guardsmen, she carried away the body of her lover, Jean Guy, who was a butcher's apprentice. There were reports in various newspapers of pétroleuses but evidence remains weak. The Paris Journal reported that soldiers arrested 13 women who allegedly threw petrol into houses. There were rumours that pétroleuses were paid 10 francs per house. While clear that Communards set some of the fires, the reports of women participating in it was overly exaggerated at the time. Some women organised a feminist movement, following earlier attempts in 1789 and 1848. Thus, Nathalie Lemel, a socialist bookbinder, and Élisabeth Dmitrieff, a young Russian exile and member of the Russian section of the First International, created the Women's Union for the Defence of Paris and Care of the Wounded on 11 April 1871. The feminist writer André Léo, a friend of Paule Minck, was also active in the Women's Union. Believing that their struggle against patriarchy could only be pursued through a global struggle against capitalism, the association demanded gender and wage equality, the right of divorce for women, the right to secular education, and professional education for girls. They also demanded suppression of the distinction between married women and concubines, and between legitimate and illegitimate children. They advocated the abolition of prostitution (obtaining the closing of the maisons de tolérance, or legal brothels). The Women's Union also participated in several municipal commissions and organised cooperative workshops. Along with Eugène Varlin, Nathalie Lemel created the cooperative restaurant La Marmite, which served free food for indigents, and then fought during the Bloody Week on the barricades. Paule Minck opened a free school in the Church of Saint Pierre de Montmartre and animated the Club Saint-Sulpice on the Left Bank. The Russian Anne Jaclard, who declined to marry Dostoyevsky and finally became the wife of Blanquist activist Victor Jaclard, founded the newspaper Paris Commune with André Léo. She was also a member of the Comité de vigilance de Montmartre, along with Louise Michel and Paule Minck, as well as of the Russian section of the First International. Victorine Brocher, close to the IWA activists, and founder of a cooperative bakery in 1867, also fought during the Commune and the Bloody Week. Louise Michel, the famed "Red Virgin of Montmartre" (see photo), who would later be deported to New Caledonia, was one of those who symbolised the active participation of a small number of women in the insurrectionary events. A female battalion from the National Guard defended the Place Blanche during the repression. The Commune named Francis Jourde as the head of the Commission of Finance. A former clerk of a notary, accountant in a bank and employee of the city's bridges and roads department, Jourde maintained the Commune's accounts with prudence. Paris's tax receipts amounted to 20 million francs, with another six million seized at the Hotel de Ville. The expenses of the Commune were 42 million, the largest part going to pay the daily salary of the National Guard. Jourde first obtained a loan from the Rothschild Bank, then paid the bills from the city account, which was soon exhausted. The gold reserves of the Bank of France had been moved out of Paris for safety in August 1870, but its vaults contained 88 million francs in gold coins and 166 million francs in banknotes. When the Thiers government left Paris in March, they did not have the time or the reliable soldiers to take the money with them. The reserves were guarded by 500 national guardsmen who were themselves Bank of France employees. Some Communards wanted to appropriate the bank's reserves to fund social projects, but Jourde resisted, explaining that without the gold reserves the currency would collapse and all the money of the Commune would be worthless. The Commune appointed Charles Beslay as the Commissaire of the Bank of France, and he arranged for the Bank to loan the Commune 400,000 francs a day. This was approved by Thiers, who felt that to negotiate a future peace treaty the Germans were demanding war reparations of five billion francs; the gold reserves would be needed to keep the franc stable and pay the indemnity. Jourde's prudence was later condemned by Karl Marx and other Marxists, who felt the Commune should have confiscated the bank's reserves and spent all the money immediately. Le Père Duchêne looks at the statue of Napoleon on top of the Vendôme column, about to be torn down by the Communards. From 21 March, the Central Committee of the National Guard banned the major pro-Versailles newspapers, Le Gaulois and Le Figaro. 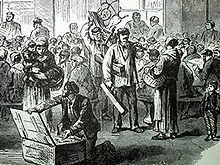 Their offices were invaded and closed by crowds of the Commune's supporters. After 18 April other newspapers sympathetic to Versailles were also closed. The Versailles government, in turn, imposed strict censorship and prohibited any publication in favour of the Commune. At the same time, the number of pro-Commune newspapers and magazines published in Paris during the Commune expanded exponentially. The most popular of the pro-Commune newspapers was Le Cri du Peuple, published by Jules Valles, which was published from 22 February until 23 May. 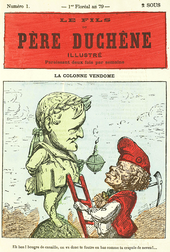 Another highly popular publication was Le Père Duchêne, inspired by a similar paper of the same name published from 1790 until 1794; after its first issue on 6 March, it was briefly closed by General Vinoy, but it reappeared until 23 May. It specialised in humour, vulgarity and extreme abuse against the opponents of the Commune. A republican press also flourished, including such papers as Le Mot d'Ordre of Henri Rochefort, which was both violently anti-Versailles and critical of the faults and excesses of the Commune. The most popular republican paper was Le Rappel, which condemned both Thiers and the killing of generals Lecomte and Clement-Thomas by the Communards. Its editor Auguste Vacquerie was close to Victor Hugo, whose son wrote for the paper. The editors wrote, "We are against the National Assembly, but we are not for the Commune. That which we defend, that which we love, that which we admire, is Paris." Destruction of the Vendôme Column during the Paris Commune. The column's destruction realized an official proposition made the previous September by painter Gustave Courbet, who, after the collapse of the Commune, was sentenced to six months in prison and later ordered to pay for putting the column back up. He could never pay, and died soon after in exile. 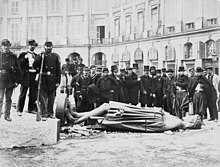 The destruction of the Vendôme Column honouring the victories of Napoleon I, topped by a statue of the Emperor, was one of the most prominent civic events during the Commune. It was voted on 12 April by the executive committee of the Commune, which declared that the column was "a monument of barbarism" and a "symbol of brute force and false pride." The idea had originally come from the painter Gustave Courbet, who had written to the Government of National Defence on 4 September calling for the demolition of the column. In October, he had called for a new column, made of melted-down German cannons, "the column of peoples, the column of Germany and France, forever federated." Courbet was elected to the Council of the Commune on 16 April, after the decision to tear down the column had already been made. The ceremonial destruction took place on 16 May. In the presence of two battalions of the National Guard and the leaders of the Commune, a band played "La Marseillaise" and the "Chant du Départ". The first effort to pull down the column failed, but at 5:30 in the afternoon the column broke from its base and shattered into three pieces. The pedestal was draped with red flags, and pieces of the statue were taken to be melted down and made into coins. In Versailles, Thiers had estimated that he needed 150,000 men to recapture Paris, and that he had only about 20,000 reliable first-line soldiers, plus about 5,000 gendarmes. He worked rapidly to assemble a new and reliable regular army. Most of the soldiers were prisoners of war who had just been released by the Germans, following the terms of the armistice. Others were sent from military units in all of the provinces. To command the new army, Thiers chose Patrice MacMahon, who had won fame fighting the Austrians in Italy under Napoleon III, and who had been seriously wounded at the Battle of Sedan. He was highly popular both within the army and in the country. By 30 March, less than two weeks after the Army's Montmartre rout, it began skirmishing with the National Guard on the outskirts of Paris. In Paris, members of the Military Commission and the Executive Committee of the Commune, as well as the Central Committee of the National Guard, met on 1 April. They decided to launch an offensive against the Army in Versailles within five days. The attack was first launched on the morning of 2 April by five battalions who crossed the Seine at the Pont de Neuilly. The National Guard troops were quickly repulsed by the Army, with a loss of about twelve soldiers. One officer of the Versailles army, a surgeon from the medical corps, was killed; the National Guardsmen had mistaken his uniform for that of a gendarme. Five national guardsmen were captured by the regulars; two were Army deserters and two were caught with their weapons in their hands. General Vinoy, the commander of the Paris Military District, had ordered any prisoners who were deserters from the Army to be shot. The commander of the regular forces, Colonel Georges Ernest Boulanger, went further and ordered that all four prisoners be summarily shot. The practice of shooting prisoners captured with weapons became common in the bitter fighting in the weeks ahead. Despite this first failure, Commune leaders were still convinced that, as at Montmartre, French army soldiers would refuse to fire on national guardsmen. They prepared a massive offensive of 27,000 national guardsmen who would advance in three columns. They were expected to converge at the end of 24 hours at the gates of the Palace of Versailles. They advanced on the morning of 3 April—without cavalry to protect the flanks, without artillery, without stores of food and ammunition, and without ambulances—confident of rapid success. They passed by the line of forts outside the city, believing them to be occupied by national guardsmen. In fact the army had re-occupied the abandoned forts on 28 March. The National Guard soon came under heavy artillery and rifle fire; they broke ranks and fled back to Paris. Once again national guardsmen captured with weapons were routinely shot by army units. Under the new decree, a number of prominent religious leaders were promptly arrested, including the Abbé Deguerry, the curé of the Madeleine church, and the archbishop of Paris Georges Darboy, who was confined at the Mazas prison. The National Assembly in Versailles responded to the decree the next day; it passed a law allowing military tribunals to judge and punish suspects within 24 hours. Émile Zola wrote, "Thus we citizens of Paris are placed between two terrible laws; the law of suspects brought back by the Commune and the law on rapid executions which will certainly be approved by the Assembly. They are not fighting with cannon shots, they are slaughtering each other with decrees." The popular journalist Félix Pyat became one of the most influential members of the Commune and its Committee for Public Safety. He went into exile during the Bloody Week, was later amnestied and elected to the National Assembly. By April, as MacMahon's forces steadily approached Paris, divisions arose within the Commune about whether to give absolute priority to military defence, or to political and social freedoms and reforms. The majority, including the Blanquists and the more radical revolutionaries, supported by Le Vengeur of Pyat and Le Père Duchesne of Vermersch, supported giving the military priority. The publications La Commune, La Justice and Valles' Le Cri du Peuple feared that a more authoritarian government would destroy the kind of social republic they wanted to achieve. Soon, the Council of the Commune voted, with strong opposition, for the creation of a Committee of Public Safety, modelled on the eponymous Committee that carried out the Reign of Terror (1793–94). Because of the implications carried by its name, many members of the Commune opposed the Committee of Public Safety's creation. The Committee was given extensive powers to hunt down and imprison enemies of the Commune. Led by Raoul Rigault, it began to make several arrests, usually on suspicion of treason, intelligence with the enemy, or insults to the Commune. Those arrested included General Edmond-Charles de Martimprey, the governor of the Invalides, alleged to have caused the assassination of revolutionaries in December 1851—as well as more recent commanders of the National Guard, including Gustave Cluseret. High religious officials had been arrested: Archbishop Darboy, the Vicar General Abbé Lagarde, and the Curé of the Madeleine Abbé Deguerry. The policy of holding hostages for possible reprisals was denounced by some defenders of the Commune, including Victor Hugo, in a poem entitled "No Reprisals" published in Brussels on 21 April. On 12 April, Rigault proposed to exchange Archbishop Darboy and several other priests for the imprisoned Blanqui. Thiers refused the proposal. On 14 May, Rigault proposed to exchange 70 hostages for the extreme-left leader, and Thiers again refused. The officers of the National Guard were elected by the soldiers, and their leadership qualities and military skills varied widely. Gustave Clusaret, the commander of the National Guard until his dismissal on 1 May, had tried to impose more discipline in the army, disbanding many unreliable units and making soldiers live in barracks instead of at home. He recruited officers with military experience, particularly Polish officers who had fled to France in 1863, after Russians crushed the January Uprising; they played a prominent role in the last days of the Commune. One of these officers was General Jaroslav Dombrowski, a former Imperial Russian Army officer, who was appointed commander of the Commune forces on the right bank of the Seine. On 5 May, he was appointed commander of the Commune's whole army. Dombrowski held this position until 23 May, when he was killed while defending the city barricades. One of the key strategic points around Paris was Fort Issy, south of the city near the Porte de Versailles, which blocked the route of the Army into Paris. The fort's garrison was commanded by Leon Megy, a former mechanic and a militant Blanquist, who had been sentenced to 20 years hard labour for killing a policeman. After being freed he had led the takeover of the prefecture of Marseille by militant revolutionaries. When he came back to Paris, he was given the rank of colonel by the Central Committee of the National Guard, and the command of Fort Issy on 13 April. The army commander, General Ernest de Cissey, began a systematic siege and a heavy bombardment of the fort that lasted three days and three nights. At the same time Cissey sent a message to Colonel Megy, with the permission of Marshal MacMahon, offering to spare the lives of the fort's defenders, and let them return to Paris with their belongings and weapons, if they surrendered the fort. Colonel Megy gave the order, and during the night of 29–30 April, most of the soldiers evacuated the fort and returned to Paris. But news of the evacuation reached the Central Committee of the National Guard and the Commune. Before General Cissey and the Versailles army could occupy the fort, the National Guard rushed reinforcements there and re-occupied all the positions. General Cluseret, commander of the National Guard, was dismissed and put in prison. General Cissey resumed the intense bombardment of the fort. The defenders resisted until the night of 7–8 May, when the remaining national guardsmen in the fort, unable to withstand further attacks, decided to withdraw. The new commander of the National Guard, Louis Rossel, issued a terse bulletin: "The tricolor flag flies over the fort of Issy, abandoned yesterday by the garrison." The abandonment of the fort led the Commune to dismiss Rossel, and replace him with Delescluze, a fervent Communard but a journalist with no military experience. Jaroslav Dombrowski, a Polish exile and former military officer, was one of the few capable commanders of the National Guard. He was killed early in the Bloody Week. The final offensive on Paris by MacMahon's army began early in the morning on Sunday, 21 May. On the front line, soldiers learned from a sympathiser inside the walls that the National Guard had withdrawn from one section of the city wall at Point-du-Jour, and the fortifications were undefended. An army engineer crossed the moat and inspected the empty fortifications, and immediately telegraphed the news to Marshal MacMahon, who was with Thiers at Fort Mont-Valérien. MacMahon immediately gave orders, and two battalions passed through the fortifications without meeting anyone, and occupied the Porte de Saint-Cloud and the Porte de Versailles. By four o'clock in the morning, sixty thousand soldiers had passed into the city and occupied Auteuil and Passy. Once the fighting began inside Paris, the strong neighborhood loyalties that had been an advantage of the Commune became something of a disadvantage: instead of an overall planned defence, each "quartier" fought desperately for its survival, and each was overcome in turn. The webs of narrow streets that made entire districts nearly impregnable in earlier Parisian revolutions had in the centre been replaced by wide boulevards during Haussmann's renovation of Paris. The Versailles forces enjoyed a centralised command and had superior numbers. They had learned the tactics of street fighting and simply tunnelled through the walls of houses to outflank the Communards' barricades. On the morning of 22 May, the regular army occupied a large area from the Porte Dauphine; to the Champs-de-Mars and the École Militaire, where general Cissey established his headquarters; to the Porte de Vanves. 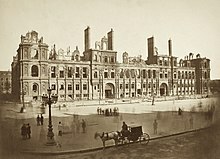 In a short time the 5th corps of the army advanced toward Parc Monceau and Place Clichy, while General Douay occupied the Place de l'Étoile and General Clichant occupied the Gare Saint-Lazaire. Little resistance was encountered in the west of Paris, but the army moved forward slowly and cautiously, in no hurry. On 23 May the next objective of the army was the butte of Montmartre, where the uprising had begun. The National Guard had built and manned a circle of barricades and makeshift forts around the base of the butte. The garrison of one barricade, at Chaussee Clignancourt, was defended in part by a battalion of about thirty women, including Louise Michel, the celebrated "Red Virgin of Montmartre", who had already participated in many battles outside the city. She was seized by regular soldiers and thrown into the trench in front of the barricade and left for dead. She escaped and soon afterwards surrendered to the army, to prevent the arrest of her mother. The battalions of the National Guard were no match for the army; by midday on the 23rd the regular soldiers were at the top of Montmartre, and the tricolor flag was raised over the Solferino tower. The soldiers captured 42 guardsmen and several women, took them to the same house on Rue Rosier where generals Clement-Thomas and Lecomte had been executed, and shot them. On the Rue Royale, soldiers seized the formidable barricade around the Madeleine church; 300 prisoners captured with their weapons were shot there, the largest of the mass executions of prisoners. The Tuileries Palace, which had been the residence of most of the monarchs of France from Henry IV to Napoleon III, was defended by a garrison of some three hundred National Guard with thirty cannon placed in the garden. They had been engaged in a day-long artillery duel with the regular army. At about seven in the evening, the commander of the garrison, Jules Bergeret, gave the order to burn the palace. The walls, floors, curtains and woodwork were soaked with oil and turpentine, and barrels of gunpowder were placed at the foot of the grand staircase and in the courtyard, then the fires were set. The fire lasted 48 hours and gutted the palace, except for the southernmost part, the Pavillon de Flore. Bergeret sent a message to the Hotel de Ville: "The last vestiges of royalty have just disappeared. I wish that the same will happen to all the monuments of Paris." The Richelieu library of the Louvre, connected to the Tuileries, was also set on fire and entirely destroyed. The rest of the Louvre was saved by the efforts of the museum curators and fire brigades. Prosper-Olivier Lissagaray, later a lover of Eleanor Marx, asserted that many of the fires were caused by artillery from the French army, and that women in the Commune were wrongly blamed for arson. The consensus of later historians is that most of the major fires were started by the National Guard and several organised Communard groups; but that few if any fires were started by the Army or by local women. Furthermore, besides public buildings, the National Guard also started fires at the homes of a number of residents associated with the regime of Napoleon III, such as that of the historian and playwright Prosper Merimee, the author of Carmen. The battles resumed at daylight on 24 May, under a sky black with smoke from the burning palaces and ministries. There was no co-ordination or central direction on the Commune side; each neighborhood fought on its own. The National Guard disintegrated, with many soldiers changing into civilian clothes and fleeing the city, leaving between 10,000 and 15,000 Communards to defend the barricades. Delescluze moved his headquarters from the Hotel de Ville to the city hall of the 11th arrondissement. More public buildings were set afire, including the Palais de Justice, the Prefecture de Police, the theatres of Châtelet and Porte-Saint-Martin, and the Church of Saint-Eustache. Most of the Palais de Justice was destroyed, but the Sainte-Chapelle survived. Fires set at the Louvre, Palais-Royal and Notre-Dame were extinguished without causing significant damage. As the army continued its methodical advance, the summary executions of captured Communard soldiers by the army continued. Informal military courts were established at the École Polytechnique, Châtelet, the Luxembourg Palace, Parc Monceau, and other locations around Paris. The hands of captured prisoners were examined to see if they had fired weapons. The prisoners gave their identity, sentence was pronounced by a court of two or three gendarme officers, the prisoners were taken out and sentences immediately carried out. Amid the news of the growing number of executions carried out by the army in different parts of the city, the Communards carried out their own executions as a desperate and futile attempt at retaliation. Raoul Rigaut, the chairman of the Committee of Public Safety, without getting the authorisation of the Commune, executed one group of four prisoners, before he himself was captured and shot by an army patrol. On 24 May, a delegation of national guardsmen and Gustave Genton, a member of the Committee of Public Safety, came to the new headquarters of the Commune at the city hall of the 11th arrondissment and demanded the immediate execution of the hostages held at the prison of La Roquette. The new prosecutor of the Commune, Théophile Ferré, hesitated and then wrote a note: "Order to the Citizen Director of La Roquette to execute six hostages." Genton asked for volunteers to serve as a firing squad, and went to the La Roquette prison, where many of the hostages were being held. Genton was given a list of hostages and selected six names, including Georges Darboy, the Archbishop of Paris and three priests. The governor of the prison, M. François, refused to give up the Archbishop without a specific order from the Commune. Genton sent a deputy back to the Prosecutor, who wrote "and especially the archbishop" on the bottom of his note. Archbishop Darboy and five other hostages were promptly taken out into the courtyard of the prison, lined up against the wall, and shot. By the end of 24 May, the regular army had cleared most of the Latin Quarter barricades, and held three-fifths of Paris. MacMahon had his headquarters at the Quai d'Orsay. The insurgents held only the 11th, 12th, 19th and 20th arrondissements, and parts of the 3rd, 5th, and 13th. Delescluze and the remaining leaders of the Commune, about 20 in all, were at the city hall of the 13th arrondissement on Place Voltaire. A bitter battle took place between about 1,500 national guardsmen from the 13th arrondissement and the Mouffetard district, commanded by Walery Wroblewski, a Polish exile who had participated in the uprising against the Russians, against three brigades commanded by General de Cissey. On the afternoon of 26 May, after six hours of heavy fighting, the regular army captured the Place de la Bastille. The National Guard still held parts of the 3rd arrondissment, from the Carreau du Temple to the Arts-et-Metiers, and the National Guard still had artillery at their strong points at the Buttes-Chaumont and Père-Lachaise, from which they continued to bombard the regular army forces along the Canal Saint-Martin. A contingent of several dozen national guardsmen led by Antoine Clavier, a commissaire and Emile Gois, a colonel of the National Guard, arrived at La Roquette prison and demanded, at gunpoint, the remaining hostages there: ten priests, thirty-five policemen and gendarmes, and two civilians. They took them first to the city hall of the 20th arrondissement; the Commune leader of that district refused to allow his city hall to be used as a place of execution. Clavier and Gois took them instead to Rue Haxo. The procession of hostages was joined by a large and furious crowd of national guardsmen and civilians who insulted, spat upon, and struck the hostages. Arriving at an open yard, they were lined up against a wall and shot in groups of ten. National guardsmen in the crowd opened fire along with the firing squad. The hostages were shot from all directions, then beaten with rifle butts and stabbed with bayonets. According to Prosper-Olivier Lissagaray, a defender of the Commune, a total of 63 people were executed by the Commune during the bloody week. Eugène Varlin, one of the leaders of the Commune, was captured and shot by soldiers at Montmartre on 28 May, the last day of the uprising. On the morning of 27 May, the regular army soldiers of Generals Grenier, Ladmirault and Montaudon launched an attack on the National Guard artillery on the heights of the Buttes-Chaumont. The heights were captured at the end of the afternoon by the first regiment of the French Foreign Legion. One of the last remaining strongpoints of the National Guard was the cemetery of Père-Lachaise, defended by about 200 men. At 6:00 in the evening, the army used cannon to demolish the gates and the First Regiment of naval infantry stormed into the cemetery. Savage fighting followed around the tombs until nightfall, when the last 150 guardsmen, many of them wounded, were surrounded; and surrendered. The captured guardsmen were taken to the wall of the cemetery, known today as the Communards' Wall, and shot. 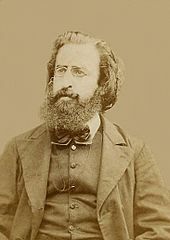 The Commune's deputy prosecutor Théophile Ferré, who handed over six hostages for execution, was executed in November 1871. In 1876 Prosper-Olivier Lissagaray, who had fought on the barricades during Bloody Week, and had gone into exile in London, wrote a highly popular and sympathetic history of the Commune. At the end, he wrote: "No one knows the exact number of victims of the Bloody Week. The chief of the military justice department claimed seventeen thousand shot." Lissagaray was referring to General Appert, who had reportedly told a National Assembly deputy that there had been 17,000 Commune casualties. "The municipal council of Paris," Lissagaray continued, "paid for the burial of seventeen thousand bodies; but a large number of persons were killed or cremated outside of Paris." "It is no exaggeration," Lissagaray concluded, "to say twenty thousand, a number admitted by the officers." In a new 1896 edition Lissagaray emphasized, "Twenty thousand men, women and children killed after the fighting in Paris and in the provinces." Several historians have accepted the 20,000 figure, among them Pierre Milza, Alfred Cobban and Benedict Anderson. Vladimir Lenin said that Lissagaray's estimate demonstrated ruling-class brutality: "20,000 killed in the streets... Lessons: bourgeoisie will stop at nothing." Between 1878 and 1880, a French historian and member of the Académie française, Maxime Du Camp, wrote Les Convulsions de Paris. Du Camp had witnessed the last days of the Commune, went inside the Tuileries Palace shortly after the fires were put out, witnessed the executions of Communards by soldiers, and the bodies in the streets. He studied the question of the number of dead, and studied the records of the office of inspection of the Paris cemeteries, which was in charge of burying the dead. Based on their records, he reported that between 20 and 30 May, 5,339 corpses of Communards had been taken from the streets or Paris morgue to the city cemeteries for burial. Between 24 May and 6 September, the office of inspection of cemeteries reported that an additional 1,328 corpses were exhumed from temporary graves at 48 sites, including 754 corpses inside the old quarries near Parc des Buttes-Chaumont, for a total of 6,667. Modern Marxist critics attacked du Camp and his book; Collette Wilson called it "a key text in the construction and promulgation of the reactionary memory of the Commune" and Paul Lidsky called it "the bible of the anti-Communard literature." In 2012, however, historian Robert Tombs made a new study of the Paris cemetery records and placed the number killed between 6,000 and 7,000, confirming du Camp's research. Jacques Rougerie, who had earlier accepted the 20,000 figure, wrote in 2014, "the number ten thousand victims seems today the most plausible; it remains an enormous number for the time." French writers and artists had strong views about the Commune. Gustave Courbet was the most prominent artist to take part in the Commune, and was an enthusiastic participant and supporter, though he criticised its executions of suspected enemies. On the other side, the young Anatole France described the Commune as "A committee of assassins, a band of hooligans [fripouillards], a government of crime and madness." The diarist Edmond de Goncourt, wrote, three days after La Semaine Sanglante, "...the bleeding has been done thoroughly, and a bleeding like that, by killing the rebellious part of a population, postpones the next revolution... The old society has twenty years of peace before it..."
Victor Hugo blamed Thiers for his short-sightedness. At the news that the government had failed to have the cannons seized he wrote in his diary, "He touched off the fuse to the powder keg. Thiers is premeditated thoughtlessness." On the other hand, he was critical of the Commune but sympathetic to the Communards. At the beginning of April, he moved to Brussels to take care of the family of his son, who had just died. On 9 April, he wrote, "In short, this Commune is as idiotic as the National Assembly is ferocious. From both sides, folly." He wrote poems that criticized both the government and the Commune's policy of taking hostages for reprisals, and condemned the destruction of the Vendôme Column. On 25 May, during the Bloody Week, he wrote: "A monstrous act; they’ve set fire to Paris. They’ve been searching for firemen as far away as Brussels." But after the repression, he offered to give sanctuary to members of the Commune, which, he said, "was barely elected, and of which I never approved." He became the most vocal advocate of an amnesty for exiled Communards, finally granted in the 1880s. Émile Zola, as a journalist for Le Sémaphore de Marseille, reported on the fall of the Commune, and was one of the first reporters to enter the city during Bloody Week. On 25 May he reported: "Never in civilised times has such a terrible crime ravaged a great city... The men of the Hotel de Ville could not be other than assassins and arsonists. They were beaten and fled like robbers from the regular army, and took vengeance upon the monuments and houses.... The fires of Paris have pushed over the limit the exasperation of the army. ...Those who burn and who massacre merit no other justice than the gunshot of a soldier." But on 1 June, when the fighting was over, his tone had changed, "The court martials are still meeting and the summary executions continue, less numerous, it's true. The sound of firing squads, which one still hears in the mournful city, atrociously prolongs the nightmare ... Paris is sick of executions. It seems to Paris that they're shooting everyone. Paris is not complaining about the shooting of the members of the Commune, but of innocent people. It believes that, among the pile, there are innocent people, and that it's time that each execution is preceded by at least an attempt at a serious inquiry ... When the echoes of the last shots have ceased, it will take a great deal of gentleness to heal the million people suffering nightmares, those who have emerged, shivering from the fire and massacre. Anarchists participated actively in the establishment of the Paris Commune. They included "Louise Michel, the Reclus brothers, and Eugène Varlin (the latter murdered in the repression afterwards). As for the reforms initiated by the Commune, such as the re-opening of workplaces as co-operatives, anarchists could see their ideas of associated labour beginning to be realised...Moreover, the Commune's ideas on federation obviously reflected the influence of Proudhon on French radical ideas. Indeed, the Commune's vision of a communal France based on a federation of delegates bound by imperative mandates issued by their electors and subject to recall at any moment echoed Bakunin's and Proudhon's ideas (Proudhon, like Bakunin, had argued in favour of the 'implementation of the binding mandate' in 1848...and for federation of communes). Thus both economically and politically the Paris Commune was heavily influenced by anarchist ideas." George Woodcock manifests that "a notable contribution to the activities of the Commune and particularly to the organization of public services was made by members of various anarchist factions, including the mutualists Courbet, Longuet, and Vermorel, the libertarian collectivists Varlin, Malon, and Lefrangais, and the bakuninists Elie and Elisée Reclus and Louise Michel." Mikhail Bakunin was a strong supporter of the Commune. He saw the Commune as above all a "rebellion against the State," and commended the Communards for rejecting not only the State but also revolutionary dictatorship. In a series of powerful pamphlets, he defended the Commune and the First International against the Italian nationalist Giuseppe Mazzini, thereby winning over many Italian republicans to the International and the cause of revolutionary socialism. Louise Michel was an important anarchist participant in the Paris Commune. Initially she worked as an ambulance woman, treating those injured on the barricades. During the Siege of Paris she untiringly preached resistance to the Prussians. On the establishment of the Commune, she joined the National Guard. She offered to shoot Thiers, and suggested the destruction of Paris by way of vengeance for its surrender. In December 1871, she was brought before the 6th council of war and charged with offences, including trying to overthrow the government, encouraging citizens to arm themselves, and herself using weapons and wearing a military uniform. Defiantly, she vowed to never renounce the Commune, and dared the judges to sentence her to death. Reportedly, Michel told the court, "Since it seems that every heart that beats for freedom has no right to anything but a little slug of lead, I demand my share. If you let me live, I shall never cease to cry for vengeance." Following the 1871 Paris Commune, the anarchist movement, as was the whole of the workers' movement, was decapitated and deeply affected for years. Communists, left-wing socialists, anarchists, and others have seen the Commune as a model for, or a prefiguration of, a liberated society, with a political system based on participatory democracy from the grass roots up. Marx and Engels, Bakunin, and later Lenin and Mao tried to draw major theoretical lessons (in particular as regards the "dictatorship of the proletariat" and the "withering away of the state") from the limited experience of the Commune. Marx, in The Civil War in France (1871), written during the Commune, praised the Commune's achievements, and described it as the prototype for a revolutionary government of the future, "the form at last discovered" for the emancipation of the proletariat. Marx wrote that, "Working men's Paris, with its Commune, will be forever celebrated as the glorious harbinger of a new society. Its martyrs are enshrined in the great heart of the working class. Its exterminators, history has already nailed to that eternal pillory from which all of the prayers of their priest will not avail to redeem them." Engels echoed his partner, maintaining that the absence of a standing army, the self-policing of the "quarters", and other features meant that the Commune was no longer a "state" in the old, repressive sense of the term. It was a transitional form, moving towards the abolition of the state as such. He used the famous term later taken up by Lenin and the Bolsheviks: the Commune was, he said, the first "dictatorship of the proletariat", a state run by workers and in the interests of workers. But Marx and Engels were not entirely uncritical of the Commune. The split between the Marxists and anarchists at the 1872 Hague Congress of the First International (IWA) may in part be traced to Marx's stance that the Commune might have saved itself had it dealt more harshly with reactionaries, instituted conscription, and centralised decision-making in the hands of a revolutionary direction. The other point of disagreement was the anti-authoritarian socialists' opposition to the Communist conception of conquest of power and of a temporary transitional state: the anarchists were in favour of general strike and immediate dismantlement of the state through the constitution of decentralised workers' councils, as those seen in the Commune. Lenin, like Marx, considered the Commune a living example of the "dictatorship of the proletariat". But he criticised the Communards for not having done enough to secure their position, highlighting two errors in particular. The first was that the Communards "stopped half way ... led astray by dreams of ... establishing a higher [capitalist] justice in the country ... such institutions as the banks, for example, were not taken over". Secondly, he thought their "excessive magnanimity" had prevented them from "destroying" the class enemy. For Lenin, the Communards "underestimated the significance of direct military operations in civil war; and instead of launching a resolute offensive against Versailles that would have crowned its victory in Paris, it tarried and gave the Versailles government time to gather the dark forces and prepare for the blood-soaked week of May". The American Ambassador in Paris during the Commune, Elihu Washburne, writing in his personal diary which is quoted at length in noted historian David McCullough's book, The Greater Journey (Simon & Schuster 2011), described the Communards as "brigands", "assassins", and "scoundrels"; "I have no time now to express my detestation.... [T]hey threaten to destroy Paris and bury everybody in its ruins before they will surrender." The red banner from the Commune brought to Moscow by French communists. Jun 1924 On the photo: Kliment Voroshilov first on the right, Grigory Zinoviev third from the right, Avel Enukidze fourth from the right and Nikolay Antipov fifth from the right. The Paris Commune inspired other uprisings named or called Communes: in Moscow (December 1905); Budapest (March–July 1919); Canton (December 1927), most famously, Petrograd (1917), and Shanghai (1927 and 1967). The Commune was regarded with admiration and awe by later Communist and leftist leaders. Vladimir Lenin wrote: "We are only dwarves perched on the shoulders of those giants." He celebrated by dancing in the snow in Moscow on the day that his Bolshevik government was more than two months old, surpassing the Commune. The ministers and officials of the Bolshevik government were given the title Commissar, which was borrowed directly from the Commissaires of the Commune. Lenin's Mausoleum in Moscow was (and still is) decorated with red banners from the Commune, brought to Moscow in 1924 by French communists. Stalin wrote: "In 1917 we thought that we would form a commune, an association of workers, and that we would put an end to bureaucracy...That is a goal that we are still far from reaching." The Bolsheviks renamed their dreadnought battleship Sevastopol to Parizhskaya Kommuna. In the years of the Soviet Union, the spaceflight Voskhod 1 carried part of a Communard banner. The National Assembly decreed a law on 24 July 1873, for the construction of the Basilica of Sacré-Cœur on Montmartre, near the location of the cannon park and where General Clément-Thomas and General Lecomte were killed, specifying that it was to be erected to "expiate the crimes of the Commune". A plaque and a church, Notre-Dame-des-Otages [fr] (Our Lady of the Hostages) on rue Haxo mark the place where fifty hostages, including priests, gendarmes and four civilians, were shot by a firing squad. A plaque also marks the wall in Père Lachaise Cemetery where 147 Communards were executed, commonly known as the Communards' Wall. Memorial commemorations are held at the cemetery every year in May to remember the Commune. Another plaque behind the Hôtel de Ville marks the site of a mass grave of Communards shot by the army. Their remains were later reburied in city cemeteries. A plaque honours the dead of the Commune in Père Lachaise Cemetery. Lyon. Lyon had a long history of worker's movements and uprisings. On 28 September 1870, even before the Paris Commune, the anarchist Mikhail Bakunin and socialist Paul Clusaret led an unsuccessful attempt to seize the city hall in Lyon, but were stopped, arrested and expelled from the city by national guardsmen who supported the Republic. On 22 March, when the news of the seizure of power by the Paris Commune reached Lyon, socialist and revolutionary members of the National Guard met and heard a speech by a representative of the Paris Commune. They marched to the city hall, occupied it, and established a Commune of fifteen members, of whom eleven were militant revolutionaries. They arrested the mayor and the prefect of the city, hoisted a red flag over the city hall, and declared support for the Paris Commune. A delegate from the Paris Commune, Charles Amouroux, spoke to an enthusiastic crowd of several thousand people in front of the city hall. However, the following day the national guardsmen from other neighborhoods gathered at the city hall, held a meeting, and put out their own bulletin, declaring that the takeover was a "regrettable misunderstanding," and declared their support for the government of the Republic. On 24 March, the four major newspapers of Lyon also repudiated the Commune. On 25 March, the last members of the Commune resigned and left the city hall peacefully. The Commune had lasted only two days. Marseille. Marseille, even before the Commune, had a strongly republican mayor and a tradition of revolutionary and radical movements. On 22 March, the socialist politician Gaston Cremieux addressed a meeting of workers in Marseille and called upon them to take up arms and to support the Paris Commune. Parades of radicals and socialists went into the street, chanting "Long live Paris! Long live the Commune!" On 23 March, the Prefect of the city called a mass meeting of the National Guard, expecting they would support the government; but, instead, the national guardsmen, as in Paris, stormed the city hall and took the mayor and prefect prisoner, and declared a Commune, led by a commission of six members, later increased to twelve, composed of both revolutionaries and moderate socialists. The military commander of Marseille, General Espivent de la Villeboisnet, withdrew his troops, along with many city government officials, outside Marseille, to Aubagne, to see what would happen. The revolutionary commission soon split into two factions, one in the city hall and the other in the prefecture, each claiming to be the legal government of the city. On 4 April, General Espivent, with six to seven thousand regular soldiers supported by sailors and National Guard units loyal to the Republic, entered Marseille, where the Commune was defended by about 2,000 national guardsmen. The regular army forces laid siege to the prefecture, defended by about 400 national guardsmen. The building was bombarded by artillery and then stormed by the soldiers and sailors. About 30 soldiers and 150 insurgents were killed. As in Paris, insurgents captured with weapons in hand were executed, and about 900 others were imprisoned. Gaston Cremieux was arrested, condemned to death in June 1871, and executed five months later. Other cities. There were attempts to establish Communes in other cities. A radical government briefly took charge in the industrial town of Le Creusot, from 24 to 27 March, but left without violence when confronted by the army. 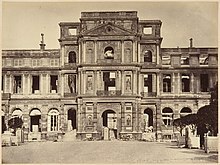 The city hall, prefecture and arsenal of Toulouse were taken over by revolutionary national guardsmen on 24 March, but handed back to the army without fighting on 27 March. There was a similar short-lived takeover over the city hall in Narbonne (23–28 March). In Limoges, no Commune was declared, but from 3 to 5 April revolutionary National Guard soldiers blockaded the city hall, mortally wounded an army colonel, and briefly prevented a regular army unit from being sent to Paris to fight the Commune, before being themselves disarmed by the army. Adolphe Thiers was formally elected the first President of the French Third Republic on August 30, 1871. He was replaced by the more conservative Patrice MacMahon in 1873. In his last years he became an ally of the republicans against the constitutional monarchists in the Assembly. When he died in 1877, his funeral was a major political event. The historian Jules Ferry reported that a million Parisians lined the streets; the funeral procession was led by the republican deputies Leon Gambetta and Victor Hugo. He was buried in Père Lachaise Cemetery, where one of the final battles of the Commune had been fought. Patrice MacMahon, the leader of the regular army that crushed the Commune, served as the President of the Third Republic from 1873 to 1879. When he died in 1893, he was buried with the highest military honours at the Invalides. Georges Clemenceau, the mayor of Montmartre at the beginning of the Commune, became the leader of the Radical Party in the French Chamber of Deputies. He was Prime Minister of France during the crucial years of World War I, and signed the Versailles Treaty, restoring Alsace and Lorraine to France. Felix Pyat, the radical journalist, slipped out of Paris near the end of the Commune and reappeared as a refugee in London. He was sentenced to death in absentia, but he and the other Communards were granted an amnesty. He returned to France, where he again became active in politics. He was elected to the Chamber of Deputies in March 1888, where he sat on the extreme left. He died in 1889. Louis Auguste Blanqui had been elected the honorary President of the Commune, but he was in prison during its entire duration. He was sentenced to be transported to a penal colony in 1872, but because of his health his sentence was changed to imprisonment. He was elected a Deputy for Bordeaux in April 1879, but was disqualified. After he was released from prison, he continued his career as an agitator. He died after giving a speech in Paris in January 1881. Like Adolphe Thiers, he is buried in Père Lachaise Cemetery, where one of the last battles of the Commune was fought. Louise Michel, the famous "Red Virgin", was sentenced to transportation to a penal colony in New Caledonia, where she served as a schoolteacher. She was amnestied in 1880, and returned to Paris, where she resumed her career as an activist and anarchist. She was arrested in 1880 for leading a mob which pillaged a bakery, was imprisoned, and then pardoned. She was arrested several more times, and once was freed by the intervention of Georges Clemenceau. She died in 1905, and was buried near her close friend and colleague during the Commune, Théophile Ferré, the man who had signed the death warrant for the Archbishop of Paris and other hostages. Among the first to write about the Commune was Victor Hugo, whose poem "Sur une barricade", written on 11 June 1871, and published in 1872 in a collection of poems under the name L' Année terrible, honours the bravery of a twelve-year-old Communard being led to the execution squad. Jules Vallès, editor of Le Cri du Peuple, wrote a trilogy Jacques Vingtras: L'Enfant, Le Bachelier, L'insurgé, between 1878 and 1880, the complete novels being published only in 1886, after his death. Émile Zola's 1892 novel La Débâcle is set against the background of the Franco-Prussian War, the Battle of Sedan and the Paris Commune. British writer Arnold Bennett's 1908 novel The Old Wives' Tale, is in part set in Paris during the Commune. Guy Endore's 1933 horror novel The Werewolf of Paris is set during the Paris Commune and contrasts the savagery of the werewolf with the savagery of La Semaine Sanglante. French writer Jean Vautrin's 1998 novel Le Cri du Peuple deals with the rise and fall of the Commune. The Prix Goncourt winning novel is an account of the tumultuous events of 1871 told in free indirect style from the points of view of a policeman and a Communard tied together by the murder of a child and love for an Italian woman called Miss Pecci. The novel begins with the discovery of the corpse of a woman dumped in the Seine and the subsequent investigation in which the two main protagonists, Grondin and Tarpagnan, are involved. The eponymous newspaper, Le Cri du Peuple, is inspired by the actual Communard newspaper edited by Jules Vallès. The book itself is supposedly his account. The painter Gustave Courbet also makes an appearance. In The Prague Cemetery, Italian author Umberto Eco sets chapter 17 against the background of the Paris Commune. Several popular British and American novelists of the late 19th century depicted the Commune as a tyranny against which Anglo-Americans and their aristocratic French allies heroically pitted themselves. Among the most well-known of these anti-Commune novels are Woman of the Commune (1895, AKA A Girl of the Commune) by G. A. Henty and in the same year, The Red Republic: A Romance of the Commune by Robert W. Chambers. In Marx Returns by the British writer and filmmaker Jason Barker, the Commune provides the historical context to Karl Marx's revolutionary struggles, and is depicted "as a symbol of an unfinished political project." At least three plays have been set in the Commune: Nederlaget by Nordahl Grieg, Die Tage der Commune by Bertolt Brecht, and Le Printemps 71 by Arthur Adamov. New York theatre group The Civilians performed Paris Commune in 2004 and 2008. There have been numerous films set in the Commune. Particularly notable is La Commune, which runs for 5¾ hours and was directed by Peter Watkins. It was made in Montmartre in 2000, and as with most of Watkins' other films it uses ordinary people instead of actors to create a documentary effect. Soviet filmmakers Grigori Kozintsev and Leonid Trauberg wrote and directed, in 1929, the silent film The New Babylon (Novyy Vavilon) about the Paris Commune. It features Dmitri Shostakovich's first film score. The Italian composer Luigi Nono also wrote the opera Al gran sole carico d'amore (In the Bright Sunshine, Heavy with Love), which is based on the Paris Commune. Comics artist Jacques Tardi translated the Vautrin's novel (listed above) into a comic, which is also called Le Cri du Peuple. In the long-running British TV series The Onedin Line (episode 27, screened 10 December 1972), shipowner James Onedin is lured into the Commune in pursuit of a commercial debt and finds himself under heavy fire. ^ "Les aspects militaires de la Commune par le colonel Rol-Tanguy". Association des Amies et Amis de la Commune de Paris 1871. ^ March, Thomas (1896). The history of the Paris Commune of 1871. London, S. Sonnenschein & co., ltd.; New York, Macmillan & co. pp. 3–6. ^ March, Thomas (1896). The history of the Paris Commune of 1871. London, S. Sonnenschein & co., ltd.; New York, Macmillan & co. pp. 7–9. ^ 1941-, Pilbeam, Pamela M., (2000). French socialists before Marx : workers, women and the social question in France. Montreal: McGill-Queen's University Press. p. 33. ISBN 9780773583856. OCLC 767669805. ^ Milza 2009a, pp. 420–425. ^ Rougerie 2014, p. 39. ^ Rougerie 2014, pp. 40–41. ^ Gluckstein 2006, p. 231. ^ Gluckstein 2006, p. 4. ^ "Nonfiction Book Review: Massacre: The Life and Death of the Paris Commune by John Merriman. Basic, $30 (384p) ISBN 978-0-465-02017-1". PublishersWeekly.com. pp. 156–157. Retrieved 4 March 2016. ^ Zdrada, Jerzy (1973). Jarosław Dąbrowski 1836–1871. Wydawnictwo Literackie. ^ Anderson, Benedict (July – August 2004). "In the World-Shadow of Bismarck and Nobel". New Left Review. New Left Review. II (28). ^ Correspondence between Gustave Flaubert and George Sand. online-literature.com. ^ Thomas, Édith (2007) . The Women Incendiaries. Haymarket Books. ISBN 978-1-931859-46-2. ^ Lenin, Vladimir Ilyich (2004) [Originally published 23 March 1908 from speech at Geneva]. "Lessons of the Commune". Lenin Collected Works. Volume 13: June 1907 – April 1908. Translated by Isaacs, Bernard. Moscow: Progress Publishers (published 1972). pp. 475–478. Archived from the original on 12 March 2018. Retrieved 12 March 2018 – via Marxists Internet Archive and Lenin Internet Archive; originally published in Zagranichnaya Gazeta (Foreign Gazette), No. 2. ^ Castries 1983, pp. 422–461. ^ "Marx as Flawed, Manic, and One of Us: a Review of Marx Returns". 17 September 2018. Gluckstein, Donny (2006). The Paris Commune: A Revolution in Democracy. London: Bookmarks. ISBN 978-1-90-519214-4. 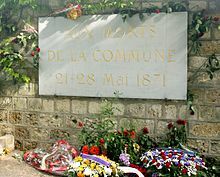 Wikimedia Commons has media related to Paris Commune.